On 12 December 2015, after 21 years of negotiations, the UN delivered a universal, legally binding climate change deal. The 32-page document sets out how countries should reduce their emissions, adapt to climate impacts and finance the low-carbon economy over the coming decades. Over the course of 2015, the text was shortened and simplified dramatically — but it was only in Paris that countries got down to the business of haggling over the most controversial elements of the text and deciding on the precise wording of the deal. Back in November, Carbon Brief created an interactive graphic capturing all the options that countries had on the table as they headed into Paris. With all debates now resolved and the text finalised, we have produced a second, final edition of this graphic, outlining and explaining all the fundamental components of the Paris deal. Among other issues, the graphic covers mitigation, adaptation, loss and damage, finance and transparency. It looks at the elements of the so-called “ambition mechanism”, the inclusion of a 1.5C aspirational target, the long-term goal, and more. 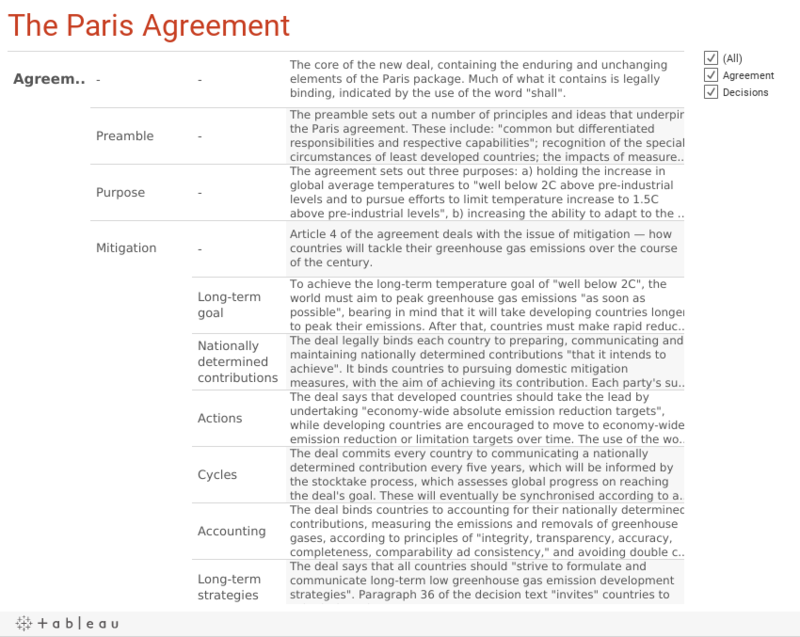 Click on each of the bubbles to reveal further details about each of the topics in the Paris deal. COP21 Paris | March 3. 2019.